The Grand National is one of the world’s richest horse races in terms of Grand National Prize Money. With £1 million in total prize money again in 2020, it’s no surprise the race will attract another big field. 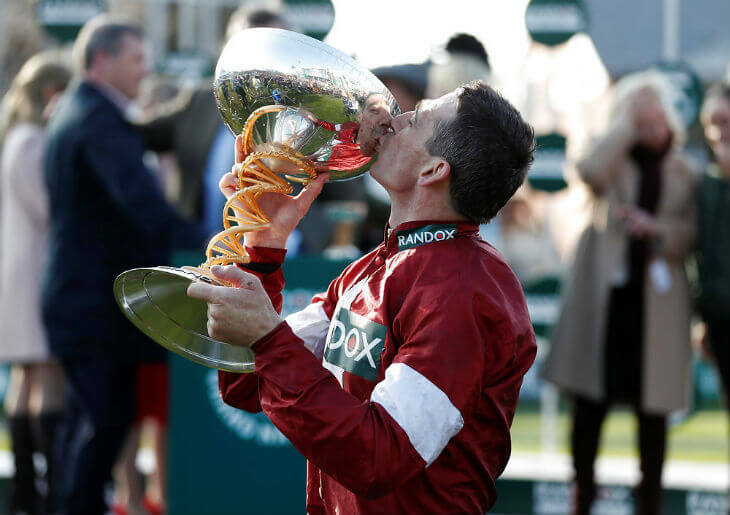 Over the years the Aintree Grand National has had many race sponsors, Though the current supporter of the world’s Greatest Steeplechase is Randox Health. In recent years we’ve seen Canadian gin firm – Seagram Distillers – sponsor the race from 1984 to 1991. While since then we’ve had Martell (1992-2004), John Smith’s (2005-2013) and Crabbie’s (2014-2016) and Randox Health (2017 ongoing). Plus, unlike the big championship races like the Cheltenham Gold Cup and Champion Hurdle, the Grand National is a race that everyday horse racing owners have a chance of winning. Yes, they still need a touch of class and, of course, stamina to win the race. But being a handicap, this always makes the Grand National open to a variety of horses of different ability. We see heavyweight owners like Trevor Hemmings, JP McManus and Gigginstown House Stud, who have won three of the last four renewals, win the Grand National. But in recent years we’ve also seen Grand National Prize money going to the likes of Auroras Encore, Pineau De Re and One For Arthur. They are winning the race for everyday owners, that might only have a few horses running under their name. In the Grand National 2017, we saw the Lucinda Russell-trained One For Arthur win the race at 14/1 for owners Deborah Thompson and Belinda McClung. These two unknown owners hit the big-time when landing the £500k first prize. With a £1million prize haul, it pays out even on the 10th-placed horse. Getting £5k for just completing the course can pay its way. With 40 runners, this means only 25% of the horses will get prize money. But going down to 10th place is much further down than any other race on the racing calendar. The winner receives a cool £500k – a life-changing amount for most horse racing owners, plus with all the spin-offs and public appearances at Grand National winner can make afterwards then many boast their earning this way too. With a £300k difference between finishing first and second, the stakes are high. Just a nose – like in 2012 when Neptune Collonges beat Sunnyhillboy can be a bitter blow for the runner-up – not just in the prestige of winning the Grand National, but also by the small sum of £300k! Third takes home £100k, while 4th pockets £65k in cash, with 5th netting £40k, 6th £30k, 7th £20k, 8th £15k, 9th £10k and 10th £5k – not a bad day’s work if you can get it! In terms of the jockeys, a National Hunt rider will receive in the region of approx £169.85 over jumps per ride, which in the whole scheme of things when it comes to the Grand National is pretty insignificant. We are sure most jockeys would ride in the race for free!! Some jockeys have personal arrangements with owners and they receive a riders’ retainers fee for riding all that owner’s horses. Powerful owners like JP McManus is an example of this, who used to have AP McCoy before he retired, riding for him for a reported £1million a year. As well as their riders’ fees, the winning jockeys will also get a percentage of the prize money. On average this is around 8-8.5% for a winning ride or 4-5% for a placed finish. Therefore, based on this the winning jockey of the Grand National in the present day will pocket around £45k for riding the winner!